Adder Snake generalized sandwich entry. 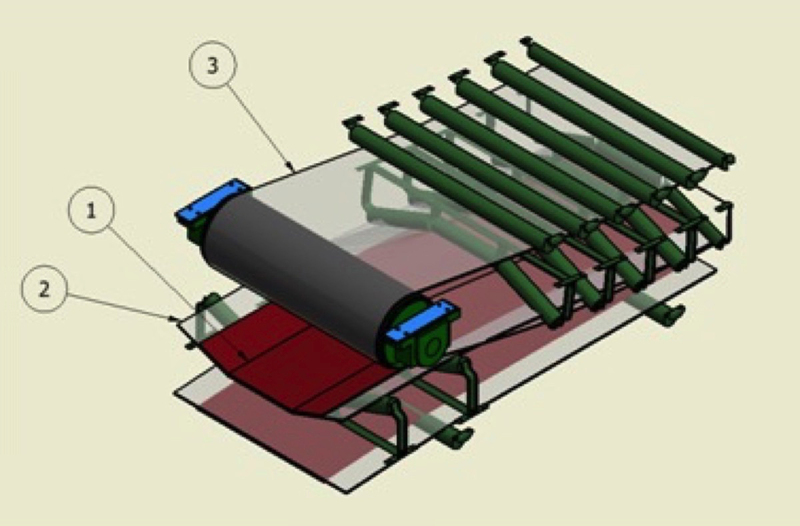 The initial design concept used a conventional conveyor “stinger” boom out from a tripper, to the tail of the high angle conveyor. This had the disadvantage of an additional transfer and extra equipment, so the client readily embraced the idea of extending the high angle conveyor tail to receive the material directly from the dock conveyor tripper. Attempted implementation of the new arrangement immediately revealed that sufficient tripper height did not exist to allow the tail of the sandwich belt high angle conveyor. The limitation was so severe that the minimum pulley diameter required for the standard sandwich conveyor belt consumed too much of the space. The solution is to employ the Adder Snake design, using a light, thin conventional belt that can be wrapped around a somewhat smaller tail pulley. This belt, which is also 400 mm narrower, will carry the material through the loading point and travel just under 7 m before being enveloped into the 1600 mm wide sandwich belt. The system will elevate 600 t/h of 0.75 t/m3 of sulfur prills around 12 m at a belt speed of 2 m/s.